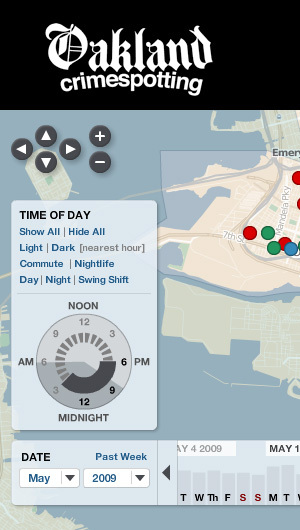 We just made a substantial change to Oakland Crimespotting that addresses two big ideas: Big Time and Little Time. Big Time is about history and trends, and you can see it in the newly-opened archives that offer links deep into the past of our crime database, from our first launch of the site in 2007, such as the assassination of Chauncey Bailey that first spurred us to release the project after I'd been personally collecting data for most of Spring and Summer 2007. There's more about this on the Crimespotting blog, I encourage you to check it out.